BATON ROUGE, La. -- A deadly shooting of Baton Rouge police officers roiled the Louisiana capital on Sunday. The city and nation were already in turmoil, with tensions over race and policing reaching a head coast-to-coast. A suspect described by police as a black male has been killed, according to officials. Police involved in the shooting included officers with the Baton Rouge Police Department and deputies from the East Baton Rouge Sheriffs Office. Here is the latest on the investigation. The deceased suspect in the deadly shooting of Baton Rouge law enforcement officers appeared to have attacked police on his 29th birthday, CBS News has learned. The suspect has been identified as a black male named Gavin Eugene Long of Kansas City, Missouri, sources confirm to CBS News. He was born on July 17, 1987. 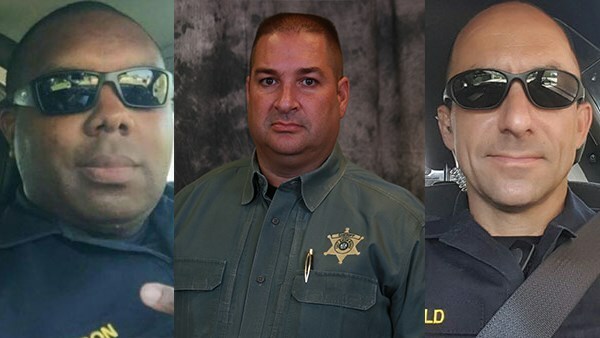 All three of the slain law enforcement officers in Baton Rouge have been identified. According to officials, one of them is Matthew Gerald, 41, of Denham Springs. Gerald was a former Marine, a former Black Hawk Crew Chief in the Army. He just graduated from the BRPD Academy in March, CBS affiliate WAFB reported. Matthew Gerald celebrated his fourth wedding anniversary just two weeks ago. WWL-TV reported Gerald and his wife, Dechia, have a 3-year-old daughter together and that Gerald had adopted his wife's daughter from a previous relationship. Family friend Skye Turner says Gerald was, "a good family man, good cop, loving husband." WWL reported Gerald was a former Marine and Blackhawk crew chief in the Army and had joined the police department four months ago. Gerald was gunned down Sunday along with two other officers. Louisiana State Rep. Ted James Sunday gave the name of the second dead officer as Montrell Jackson. James said Jackson had a 4-month-old child. James said he knows Jackson and his family personally and spoke to the family earlier Sunday. A spokeswoman for the East Baton Rouge Parish Sheriff's Office has identified the third officer killed as sheriff's deputy Brad Garafola. Casey Rayborn Hicks told The Associated Press Sunday that the slain deputy was 45-years-old and had been with the sheriff's office for 24 years. A neighbor of Garafola says he was a family man. Rhonda Smith said Sunday evening that Garafola was never seen without at least one of his four children, who range in age from 7 to 21. Smith says Garafola was, "the epitome of a peace officer." Hicks also identified the injured sheriff's deputies as 41-year-old Nicholas Tullier an 18-year veteran, and 51-year-old Bruce Simmons, a 23-year veteran. Hicks says that Tullier is in critical condition while Simmons has non-life threatening injuries. The Baton Rouge Police Department released a statement and photos of their deceased officers on Facebook. Earlier, Baton Rouge Police Cpl. L'Jean McKneely Jr. said the shooting took place outside and possibly inside the B-Quik convenience store on Airline Highway in Baton Rouge. He said the suspect's body was found next door, outside a fitness center. A law enforcement source in Baton Rouge tells CBS News correspondent David Begnaud one of the law enforcement officers was vacuuming his patrol car just before he was shot. Video shows him vacuuming his patrol car, leaving the car wash area, then returning after getting a report of a man with a weapon. A second slain officer was in the convenience store just before he was shot. The governor of Louisiana said the attack on law enforcement in Baton Rouge was unjustified. Gov. John Bell Edwards told media Sunday afternoon that the gunman committed, "an absolutely unspeakable, heinous attack." Edward said the hatred has got to stop. Republican Donald Trump is blaming a "lack of leadership" for Sunday's shooting in Baton Rouge. Trump said in a statement posted on his Twitter and Facebook pages that "We grieve for the officers killed in Baton Rouge today." Trump is placing the blame on a lack of leadership and is demanding "law and order." He asked, "How many law enforcement and people have to die because of a lack of leadership in our country? We demand law and order." Hillary Clinton released a statement on Twitter in regards to the shooting. "Today's devastating assault on police officers in Baton Rouge is an assault on all of us," she said. Attorney General Loretta Lynch, responding to the police shootings Sunday in Baton Rouge, Louisiana, said there is no place in the United States for such appalling violence. In a statement issued Sunday, Lynch said she condemns the shooting deaths of three officers and the wounding of several others "in the strongest possible terms." She also is pledging the full support of the Justice Department as the investigation unfolds. The attorney general said Agents from the FBI and Alcohol, Tobacco and Firearms are on the scene, and Justice Department will make available victim services and federal funding support, and provide investigative assistance to the fullest extent possible. Lynch said everyone's hearts and prayers are with the fallen and wounded officers, their families and the entire Baton Rouge community in "this extraordinarily difficult time." President Barack Obama said the slayings were attacks "on the rule of law and on civilized society, and they have to stop." He said there was no justification for violence against law enforcement and that the attacks are the work of cowards who speak for no one. Vice President Joe Biden said on Twitter he was joining the president in condemning the attack. I join the President in condemning today's despicable, cowardly attack in Baton Rouge. An attack on our very way of life and rule of law. We owe these officers & families more than gratitude. We owe them a commitment as a country to stand together when hate tries to divide us. Vice President Biden also released a statement condemning the shooting. "Police officers are an incredible group of men and women. We owe them our gratitude and a commitment not to let others divide us," the statement read. "That's not who they were, that's not who they are." Baton Rouge has been tense since the July 5 shooting of a black man pinned to the ground by white police officers. At a three-hour service Friday, mourners paid their respects to 37-year-old Alton Sterling, whose shooting outside a convenience store began a tumultuous week in race relations in America. On Friday, grieving residents of Baton Rouge honored an appeal at the funeral of Sterling to celebrate his life rather than demonstrate about his death. "If you want to protest, please leave now," Gary Chambers, master of ceremonies for the funeral, said at the beginning that the event at Southern University. A steady stream of mourners filed past Sterling's casket, which was adorned with music notes and a smiling photo of the man. Sterling was selling CDs outside the Triple S Food Mart store, as he had done for years, when he was killed by police responding to a call of a man threatening someone with a gun. Police have said they found a gun in Sterling's pocket. Sterling's death was captured on cellphone video and circulated widely on the internet. His death, along with another fatal police shooting in Minnesota last week, sparked widespread protests. Then the fatal shooting of five police officers in Dallas by a black sniper heightened tensions even more. Sterling's death heightened tensions in Baton Rouge, where about 200 protesters were arrested over the weekend. East Baton Rouge Parish District Attorney Hillar Moore said his office reviewed initial police reports on 185 arrests between July 8-11 and determined it will not prosecute roughly 100 of those cases. Moore said they involve protesters who were arrested only on misdemeanor charges of obstruction of a roadway or public passage. DeRay Mckesson, a prominent Black Lives Matter activist, was among them. Moore said his office is reviewing the rest of the arrests, which include allegations such as resisting arrest, carrying guns or some "act of violence."